House Minority Leader Nancy Pelosi says she is prepared to keep the “government closed forever” instead of funding Trump’s border wall. Thegatewaypundit.com reports: “Does he want to have government closed forever? What’s this about?” Pelosi asked. On Tuesday, President Trump said that he would be proud to shut down the federal government if Democrats don’t agree to fund border security, especially the border wall. “Let’s hope that there won’t be a shutdown of the government. That’s a very bad thing to do. Maybe the president doesn’t grasp that, but that is very harmful to our country,” Pelosi told reporters. 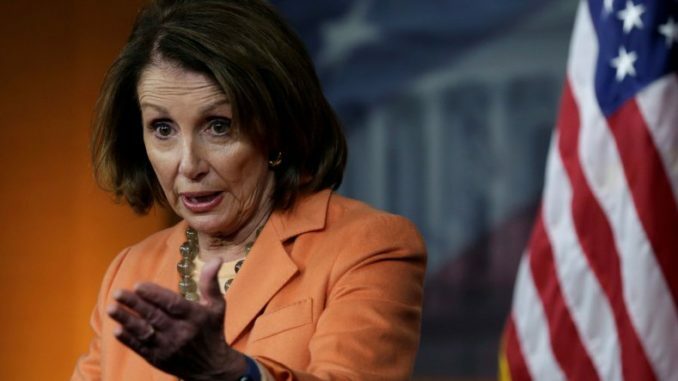 Pelosi flatly refused the $5 billion President Trump has requested towards a border wall. When reps had house senate and executive branch they refused the wall come Jan. any idea of wall happening is gone, game over, they both demos and repubs. will turn usa into giant version of shithole brazil, as that was the globalist plan all along.